First, it’s important to understand that, like humans, pets can be treated for cancer, and sometimes even cured. Take a deep breath and get ready to arm yourself with knowledge—and support. After all, the cancer journey affects the entire family. Caregivers need support too! Fortunately, there are a lot of resources out there. Assemble an all-star medical team. If your pet’s primary care veterinarian made the diagnosis, be sure to ask for a referral to a board-certified veterinary oncologist. Taking your pet for a consultation with a veterinarian that specializes in treating pets with cancer will provide you with the information you need to make the best decisions regarding your pet’s care. If you are already seeing an oncology specialist, they probably have a variety of suggestions for how to best manage this process. Ask about the latest treatment options. Standard treatment options for humans are gradually making their way into veterinary medicine. For instance, stereotactic radiosurgery (SRS) is now available at several locations around the country (with more on the way!). It is the most advanced form of radiation therapy; it’s noninvasive, and it can help many pets with cancers previously thought to be untreatable. Ask about clinical trials. Many universities as well as private veterinary oncology practices participate in clinical trials. Sometimes these trials are partially or fully funded, meaning you get the newest drugs for only the cost of ancillary services (blood tests, hazardous waste disposal, etc.). Ask about nutrition and supplements. If your pet is treated with chemotherapy, you want to keep their immune system strong. Likewise, it is now more important than ever to be sure they are on a diet complete with vitamins and minerals known to boost immunity. If they have some periods of inappetence, there are ways to stimulate the appetite to keep them well nourished. Ask about easy ways to administer medication. There are flavor enhancements that can be added to medications through compounding to make them tastier. You can also find pill pockets and other food treats that disguise the medication and make medicine time fun. Ask about integrative therapies. If we truly want to treat the whole pet, and not just the cancer, acupuncture, massage, and pain management should be considered. Build an emotional support team. For many of us, our pets are members of our family. Helping a loved one deal with cancer is not easy. To access emotional support for you and your family, there are many groups you can turn to across the country, including some that specialize in helping children deal with grief. One need only look as far as the Internet to find emotional support during your pet’s cancer journey. Additionally, talk to your veterinarian. Guiding you through the cancer diagnosis and treatment process is their specialty. 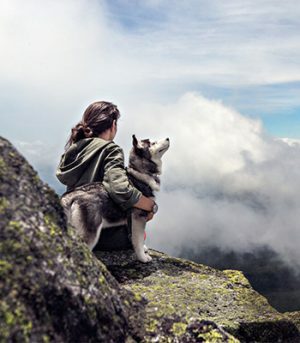 PetCure Oncology also provides a forum for pet owners to post questions to our care team and other pet families who have experienced pet cancer. Fill out the form below at the bottom of our Pet Families FAQ page to be connected with our team or another pet family. Spend time with your furry family member. In addition to the above, plan to do all of the things your pet loves: take car rides, frolic on the beach, go on short hikes, visit loved ones—pack it all in. While you know he or she has cancer, your pet doesn’t. So why not spoil them (and yourself) with what they love most—spending time together. After all, as the leader of their pack, they are counting on you to give them the best life possible. If your pet has been diagnosed with cancer, we are here to help. Contact us at 773.850.3400 or Hope@PetCureOncology.com.